BICC’s research and advisory work strives to reduce the potentially harmful effects accompanying any effort to organize violence in social relations. We analyze concepts, means and practices of organized violence on different scales of social interaction (local, national, regional, global). BICC does not only study organized violence as an isolated phenomenon but also considers the deeper political, social, economic as well as cultural and material conditions that engender various ways of organizing violence as well as the wider effects of organized violence on social order. 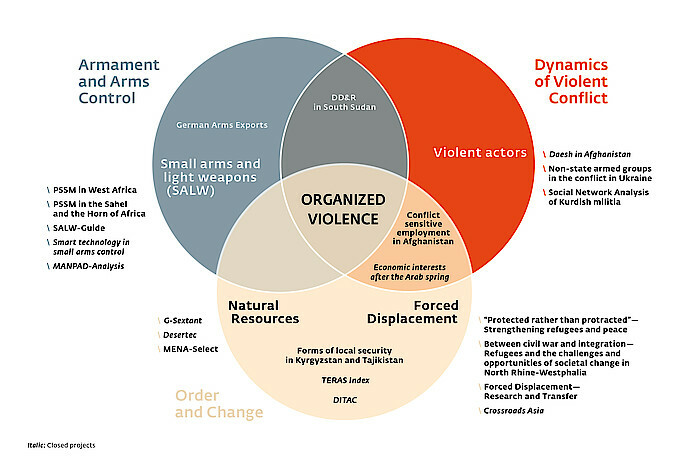 BICC analyzes organized violence from different academic angles. It sees its unique contribution to peace and conflict research in its critical inter- and transdisciplinary approach, its problem-orientation and its policy relevance. BICC grounds its conceptual approaches and methods in extensive field research and benefits from the mutual gains of combining research and advisory work.